Your @SoundersFC looking absolutely fantastic in those #PitchBlack kits. Just a great look. Unreal. 1’ - It’s @CBarrett19 and @kennycooperjr who kick us off here at Red Bull Arena! 1’ - Goal for the Red Bulls! Wow. What a start. 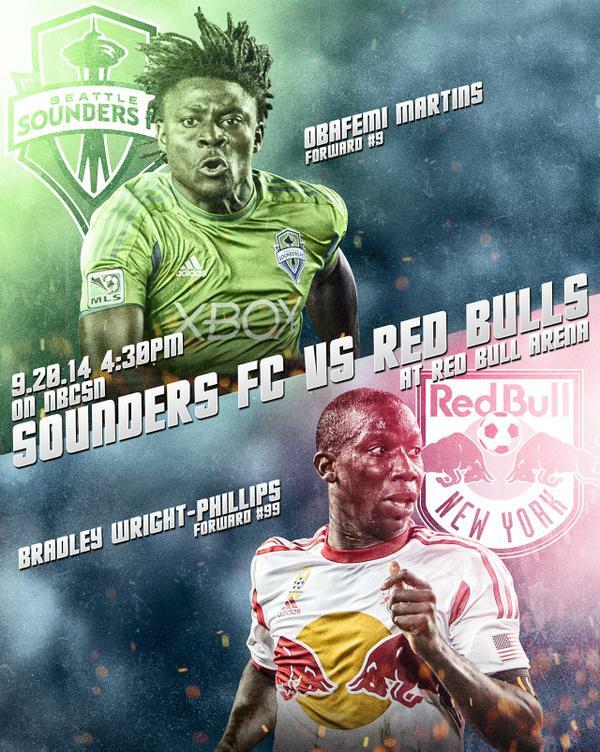 Really open at the back by Seattle and BWP slams it home in under 30 seconds. Unreal. 2’ - Ok, do over? 2’ - At the other end, Miller and Neagle clash heads with Miller getting the worst of it. He remains down. 6’ - Red Bulls still pushing here. Want a second one after BWP’s early strike. Sounders still adjusting. 7’ - #AirMarshall with a nice clearance there to deny BWP again. Red Bulls in control early on. 10’ - Sounders trying to get out of their own half. Red Bulls not having it. Not the start Seattle wanted. 11’ - CHANCE FOR SEATTLE! Pappa gets forward on the break and plays deep to Cooper who puts a but too much behind it and flies it over. 0-1. 12’ - Shot from Pappa there as Henry looses it and seems to be in a bit of pain. Definitely pulled something. 14’ - Sounders playing a bit better here in the last five minutes or so. NY’s defense can definitely be had. 16’ - FIGHT AND WIN. 17’ - Big foul comes in from Olave who is way late on Barrett. No card…but the next one will be. 18’ - Looks like the ball was going to fall nicely to Cooper but his touch was a bit off and it heads out the other way. 19’ - Marco and Lamar have swapped sides…as Marco often does. He sees the pitch well from both flanks, that boy. 20’ - Robles with a bit of a howler there as he took ages to clear and Cooper closed him down and nearly took the ball. Sloppy. 21’ - Save by Frei! Red Bulls get forward and the ball flies out wide to Sam who shoots low and hard but a great stop. Corner. 22’ - Barrett played in at a tough angle with no help. Goes for the chip. Over. 24’ - Nice work by Lamar there to track back and take the ball from BWP with a tidy tackle. Need more of that. 25’ - #GroundMarshall intercepts an Henry pass with ease. That doesn’t happen often. 26’ - More stuff going forward from Seattle here but not enough. No dangerous balls into the area. 27’ - Cooper then gets forward…nearly plays Chad in all alone but Dax with the nice tackle to clear. 28’ - CROSSBAR FROM COOPER! Corner comes in, played really deep and Kennnnny heads back across and it doinks off the bar. 29’ - Great movement there from RBNY to create the chance from Oyongo but it scoots out for a GK. Lovely pass and move. 32’ - Verrrrrry nice ball played in there by Jalil that finds Lamar but his side volley thinger goes wide. 33’ - Sounders definitely seeing more of the ball lately. Have found their rhythm. Just need the final product. 34’ - Djimi with some great work to win two tackles and get the ball to Lamar on the break. His shot is weak though and Robles holds. 35’ - Cheeky ball over the top from Marco to Kenny that forces Mr. Olave to put out for a corner. LET’S GOOOOOO! 36’ - Deep ball in again by Marco and Andy can’t get the put back on target. GK for those Metrostars. 38’ - Great response from the Sounders. Been the better team for the last 20 or so. Still waiting for the end product though. 40’ - Sounders again knocking the ball around, looking for a chance here. Andy trying to find Kenny but the whistle blows for a foul. Jeez. 45’ - NY with another chance in the Sounders area. They keep getting to that byline. It’s eventually cut out by Ozzie and cleared. 45’ - I no like this first half. 45’+ - As the Red Bulls win the corner, one minute of stoppage time is announced. That’s one and shushhhhhhh. 45’+ - From one corner to the other. First attempt is defended well and put behind. Henry trots over for the next. 45’+ - #AirMarshall clears and the whistle blows for the half. 46’ - Anddddd the @NewYorkRedBulls kick off and the second period is a-go! NY up 1-0. 46’ - Sounders with some good burst to start the second here. All over the Red Bulls and win an early corner. Good stuff. Mr. Marco to take. 47’ - This one goes right to Robles though who comes out and catches. No bueno. 48’ - Excellent surging run from Remick to split a pair and get into the box. His cross to Marco gets there but the shot is blocked. Drats. 49’ - Ozzie with a really nice interception there and shows some burst to get up field. He is good at the #soccer .